Marty Nau is a 38 year veteran of the Washington DC music scene. He began his studies in six grade on a clarinet that he inherited from his father. He added the saxophone in ninth grade so that he could play in the jazz band. In 1977 upon graduation from high school Marty entered the Navy music program and was stationed in Orlando Florida. In 1980 he transferred to the Navy band in Washington DC as a clarinet instrumentalist. In 1984 he was able to win a position in the United States Navy band premier jazz ensemble “the Commodores” where he was saxophone soloist and conductor. 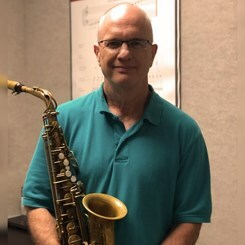 Upon retirement in 1997 from the United States Navy band Marty continued to be very active as a freelance musician in the Washington DC area. He was a member of the Capitol saxophone quartet and toured with them throughout the country playing pops concerts with orchestras. He has also played with the National symphony, Baltimore Symphony and Philadelphia Orchestra to name a few. He has toured Japan and Europe to include Russia with the Duke Ellington orchestra. He has also studied with jazz greats Phil Woods, Eddie Daniels and Hal Galper. Currently Marty maintains a private studio in his home and teaches at the Washington Conservatory of music, the Howard Community College in Columbia Maryland, and most importantly at Music And Arts in Woodbridge Virginia and Oxon Hill Maryland. He has also recorded under his own name five jazz CDs. They can be found and ordered at Amazon.com. Request Lessons with MARTIN NAU today!